We’ve combined Nine Lives and Happy Tails Stamp Sets to bring you our Pawprints Collection of tutorials! We’ve also used the Regals 6×6 Designer Paper Stack for a bright and cheerful look. 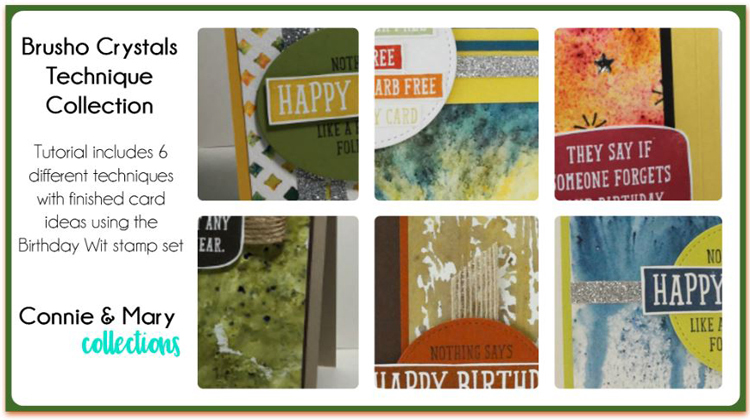 You get SIX card tutorials using these two stamp sets for only $10 US! HINT: If you only have one of the sets, you can use the images interchangeably! See the details HERE! For those of you who already have this bundle, check out our Wonderful Romance Collection of tutorials! We’ve paired it with the springy Gingham Gala 6×6 Designer Paper pack for a fresh, new look! You’ll get THREE card ideas (one a special fold) and a wonderful home décor project! See the details HERE! 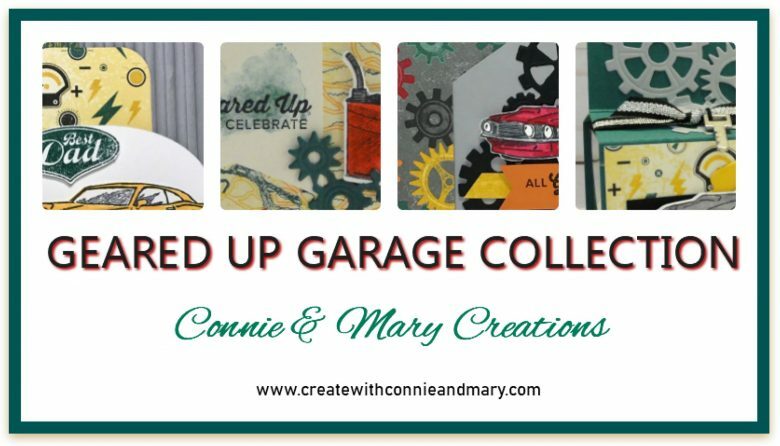 Next up from the 2019 Occasions Catalog is our Geared Up Garage Collection of tutorials! Isn’t this a great bundle? We LOVE those Garage Gear Thinlits…so different from anything Stampin’ Up! has offered before! We have three cards (one a special fold) and a wonderful treat 3D project, all designed by Connie and Mary! See the details HERE! “Hey Love” is a FUN and whimsical stamp set just perfect for Valentines and not just for kids! We LOVE the SIX little treat boxes we’ve come up with for our Hey Love Valentine Treat Box Collection!!! Just TOO “Stinkin’ Sweet”! 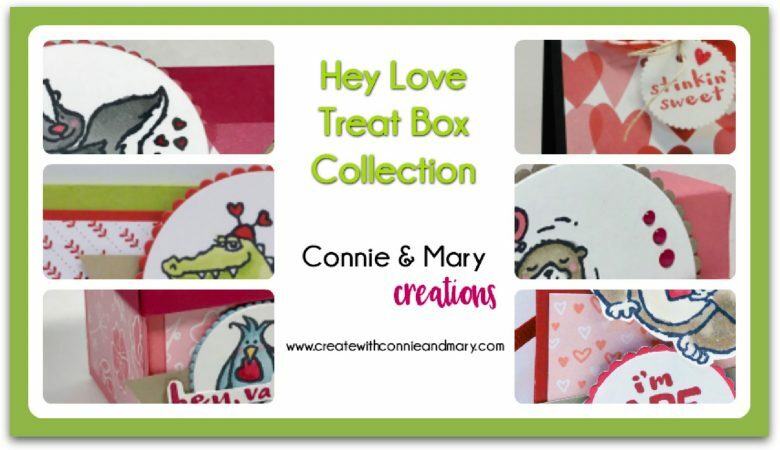 In this Hey Love Collection, you’ll get the tutorials for SIX great treat boxes all designed by Connie and Mary! See more details HERE! 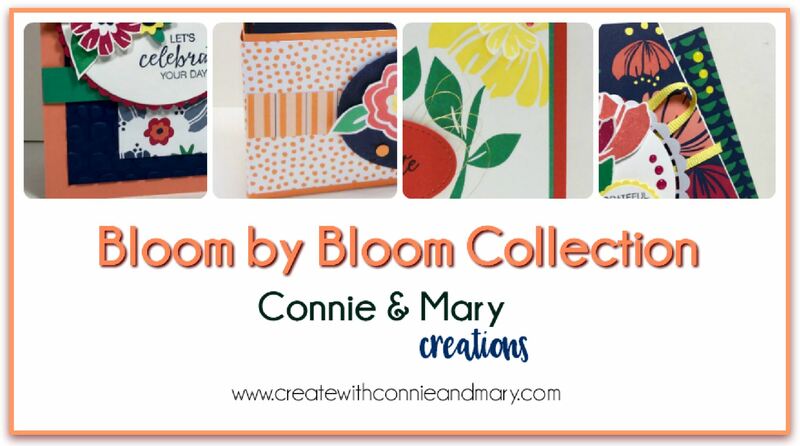 These newest tutorials feature the FANTASTIC Bloom by Bloom stamp set and Happiness Blooms Suite of products! We fell in love with the bright, bold colors and retro flower look and are excited for you to see what we did with them! We have three cards (one a special fold) and a wonderful organizing project, all designed by Connie and Mary! See the details HERE! 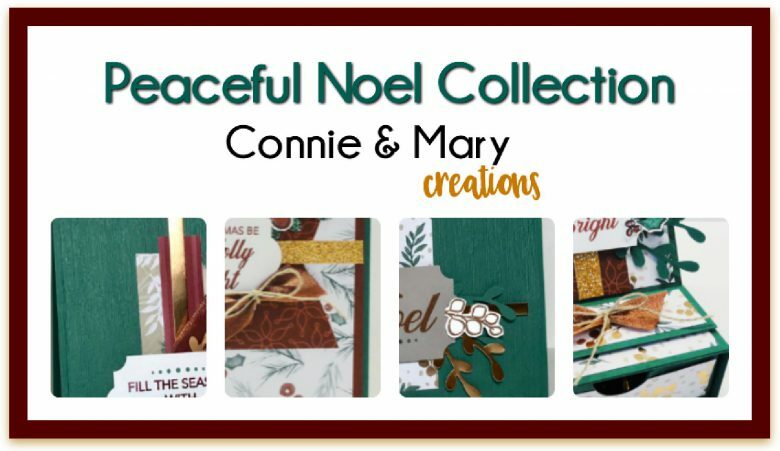 It’s Week 4 of our Christmas is Coming series and Connie and Mary are featuring the beautiful Peaceful Noel Stamp set with Sprig Punch! This suite makes beautiful cards AND the coordinating Sprig Punch can be used for SO many different things…not just Christmas! You’ll get THREE card and ONE small 3D tutorials (perfect for craft fairs or a small gift!) using this week’s Peaceful Noel Bundle for only $10! See all the details HERE! 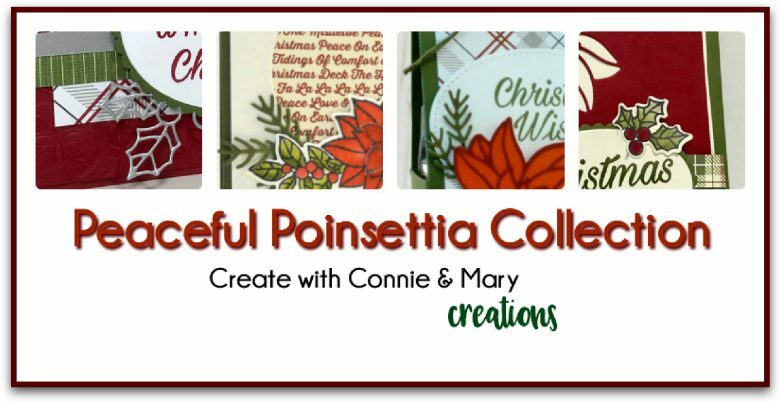 It’s Week 3 of our Christmas is Coming Series and Connie and Mary are featuring the Peaceful Poinsettia stamp set with the Detailed Poinsettia Thinlit Dies! The detailed dies in this bundle are BEAUTIFUL and we know you’ll LOVE this Collection! You’ll get THREE card and ONE small 3D packaging tutorials with this week’s Peaceful Poinsettia Bundle for only $10! See the details HERE! 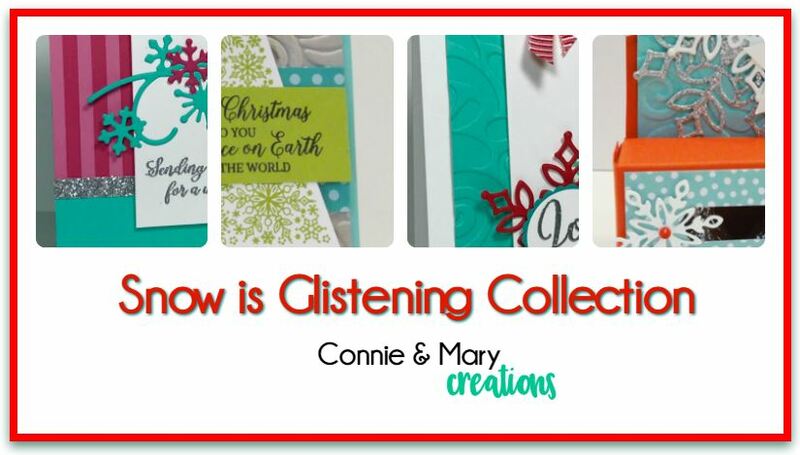 It’s Week 2 of our Christmas is Coming Series and Connie and Mary are featuring the Happiness Surrounds stamp set with the Snowfall Framelits! This stamp set is NOT just for Christmas…although we’ve featured two of the projects as Christmas this week. (The exclusive “Snowflake Showcase” products are only available to purchase in November, while supplies last!) You’ll get THREE card and one small 3D tutorials with this week’s Happiness Surrounds and Snowfall Thinlit Collection for only $10! See details HERE! We are SO excited to be launching our new Christmas is Coming series over the next five weeks! 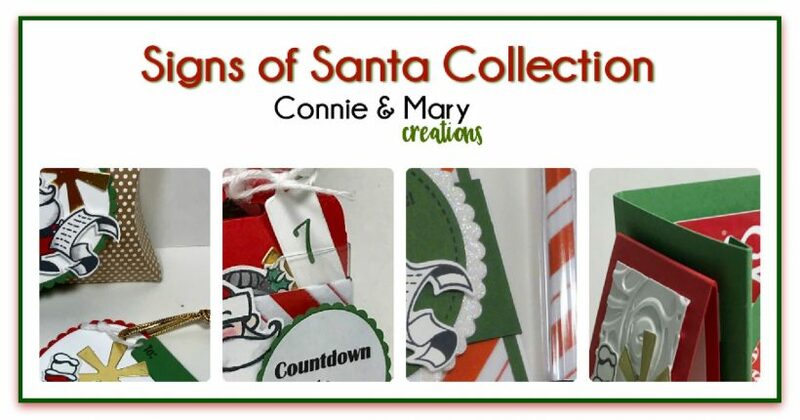 We know some of you like to plan ahead and need ideas for your classes or holiday cards! This series of Collections is for you! Each WEEK we will feature a new stamp set/bundle and offer tutorials with THREE cards and ONE small gift item…great for friends and co-workers…or for those craft sales coming up! 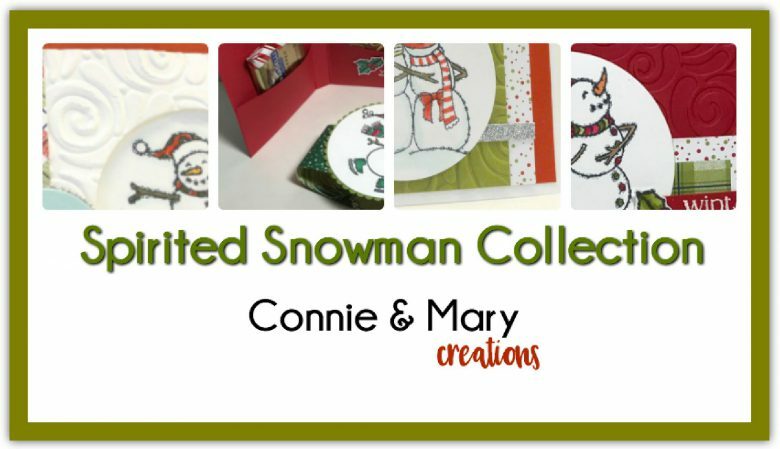 Our first week features the SNOW IS GLISTENING BUNDLE with stamp set and Snowfall Thinlits, designed by Connie and Mary! The Snowflake Showcase products are only available to purchase in November, or while supplies last! See more details HERE! 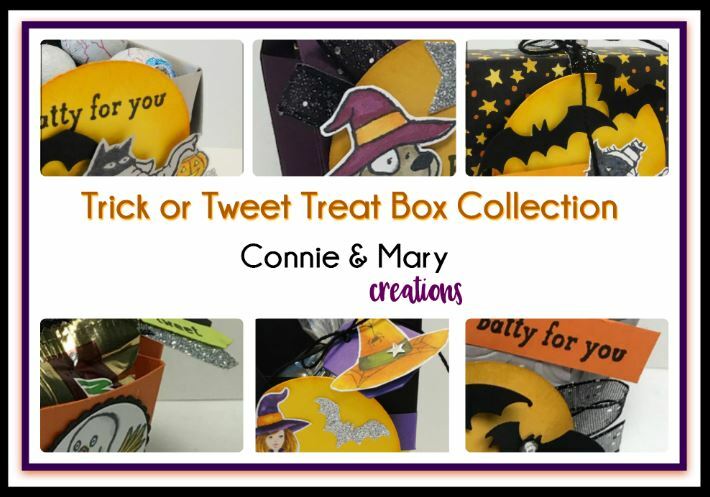 We have the brand new “TRICK OR TWEET” TREAT BOXES COLLECTION featuring SIX treat box tutorials available for you to get ready for some Halloween FUN! 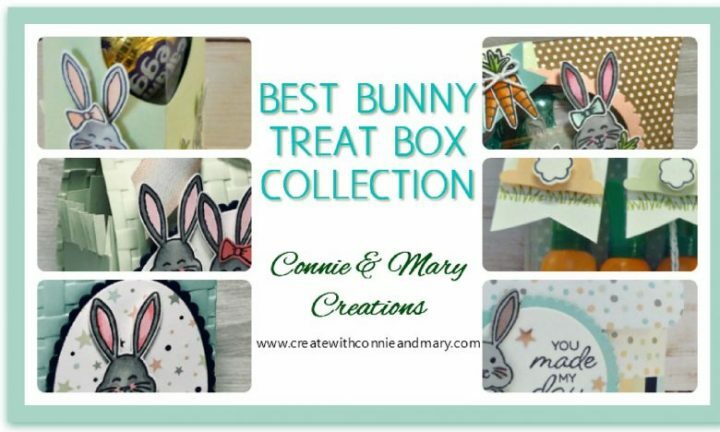 Designed by Connie and Mary, this Collection was SO much fun to design and has a total of SIX tutorials…THREE altered ways to use the TAKEOUT THINLIT DIES for three unique boxes, plus THREE other treat box designs! We’ve featured the cute TRICK OR TWEET stamp set, too! These boxes are PERFECT for your fall craft shows! Find all the details HERE! 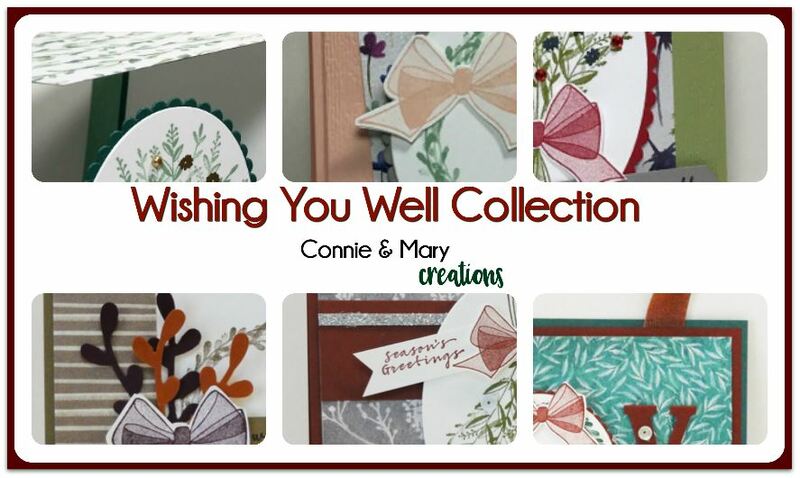 Our new WISHING YOU WELL COLLECTION tutorial is one of our favorites so far! 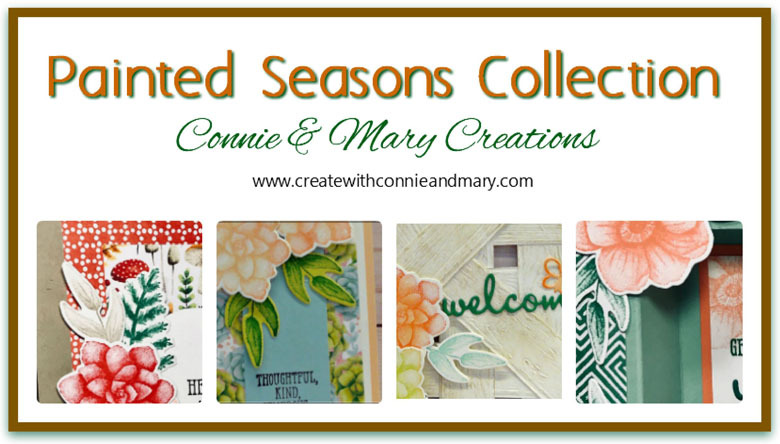 Designed by Connie and Mary, this Collection includes SIX projects. You’ll have FOUR seasonal cards, PLUS a fun-fold card AND a home decor hanging using the Wishing You Well stamp set from the NEW Holiday Stampin’ Up! catalog! What a FUN class with SIX easy to make projects! See details HERE! 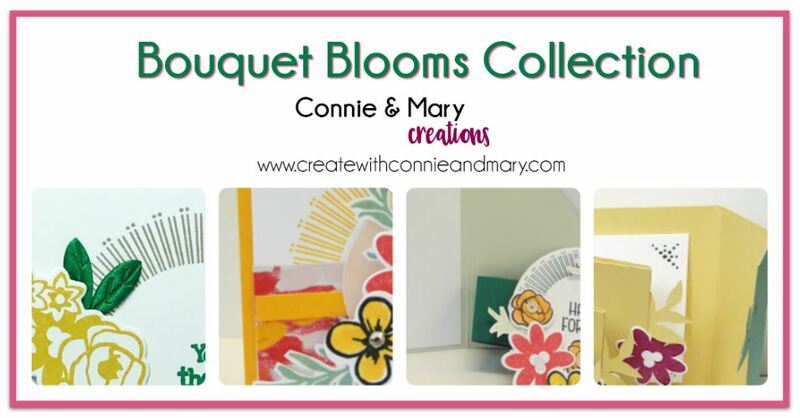 This collection tutorial using the Bouquet Blooms Bundle, is now available! 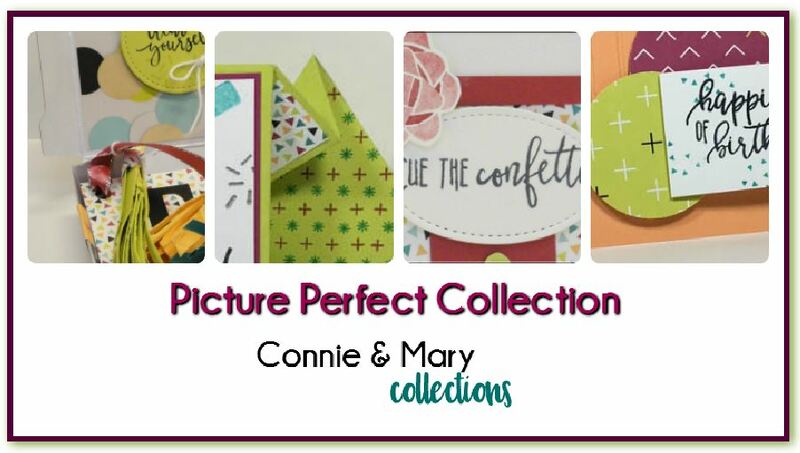 Designed by Connie and Mary, this Collection includes tutorials for four projects…THREE cards, one a special fold, and a fabulous mini scrapbook/multi-gift card holder you won’t want to miss! See details HERE! 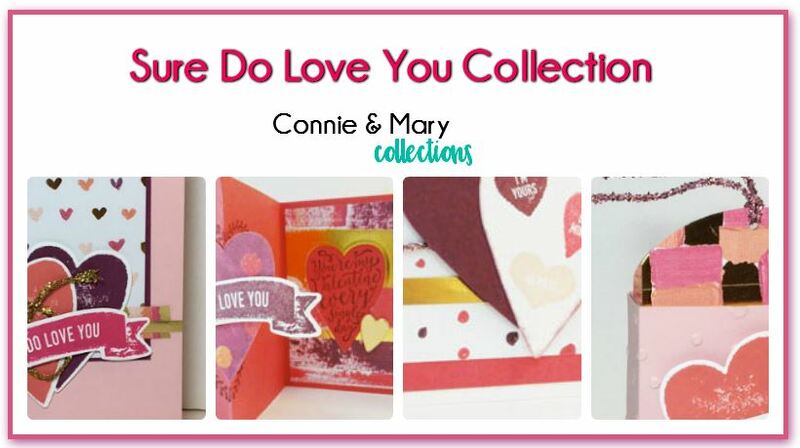 We have a BRAND NEW tutorial collection using Stampin’ Up!’s Love You To Pieces Bundle. 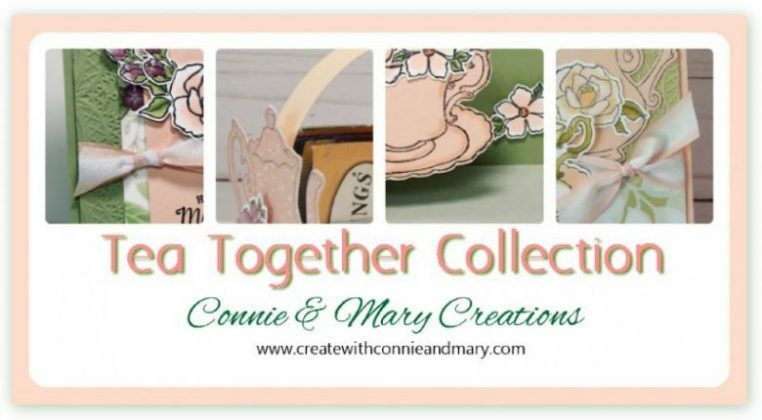 Designed by Connie and Mary, this LARGER Collection includes six projects…TWO 3D projects perfect for hostess gifts or craft fairs, TWO special fold cards and TWO regular cards! We know you will LOVE this collection of tutorials! They are SO cute! See Details HERE! It’s Christmas in July! 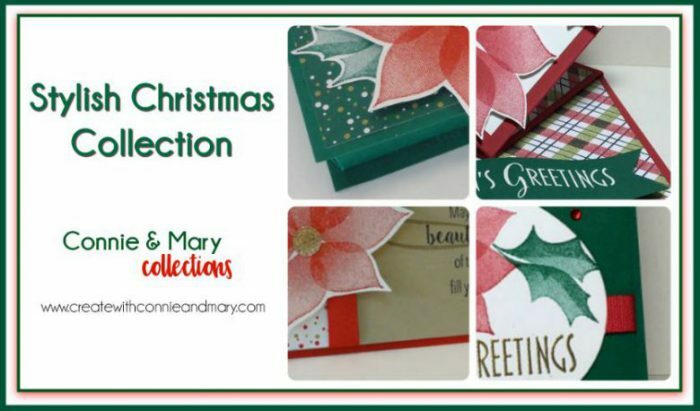 We have a BRAND NEW tutorial collection using Stampin’ Up!’s Stylish Christmas. 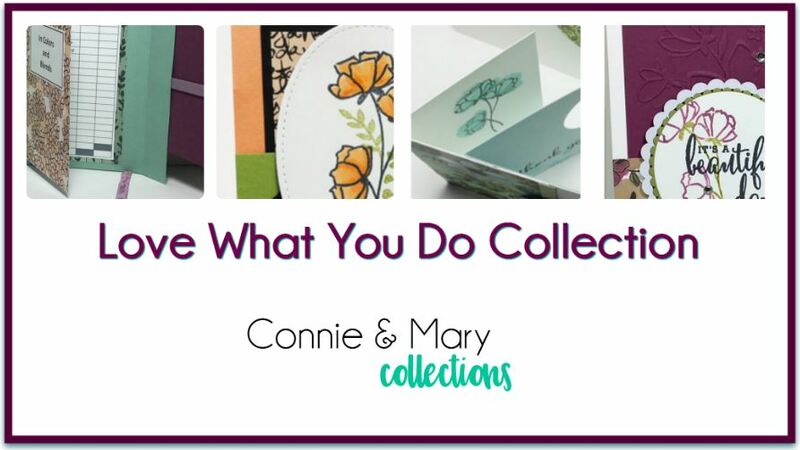 Designed by Connie and Mary, this Collection includes an exclusive gift box project…perfect for upcoming craft fairs or gifts…and three cards (one with a special fold!) See details HERE! 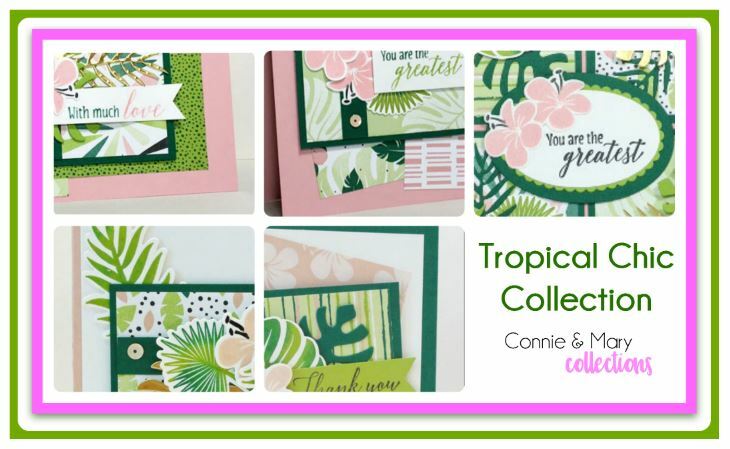 We have a BRAND NEW tutorial collection using Stampin’ Up!’s Tropical Chic Product Suite. 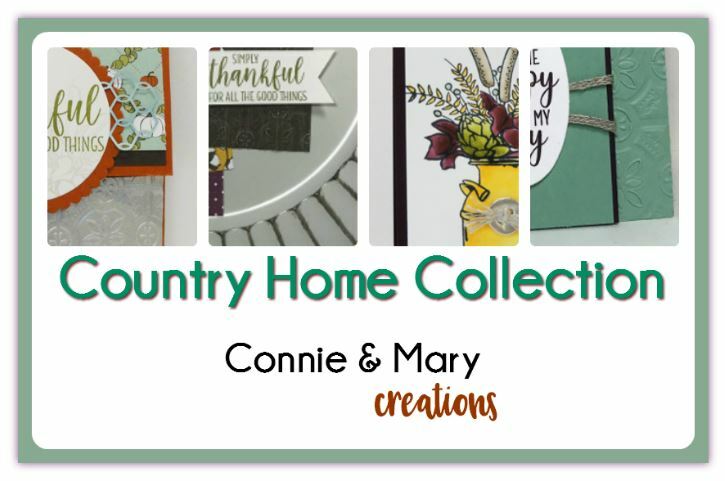 Designed by Connie and Mary, this LARGER Collection includes options! Do the Home Decor Frame Sampler alone, the 4 cards alone, or both together! The base panels are the same for both, just add on the extras to make it a frame sampler or cards or both! This could easily be split into two separate classes! See more details HERE! 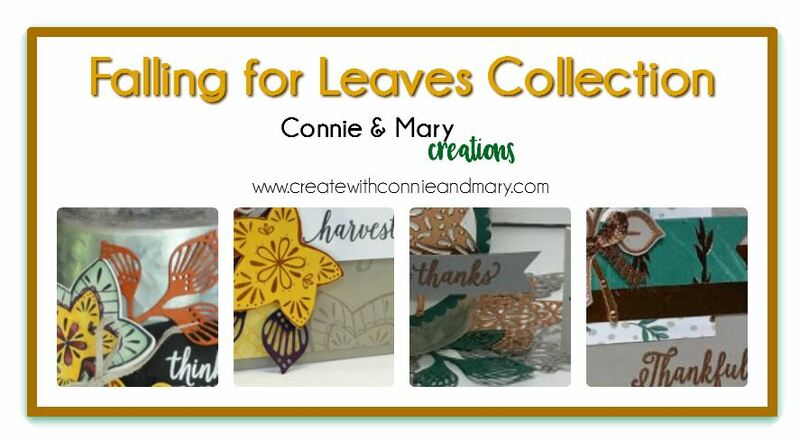 We have another tutorial collection using Stampin’ Up!’s Varied Vases Product Suite. 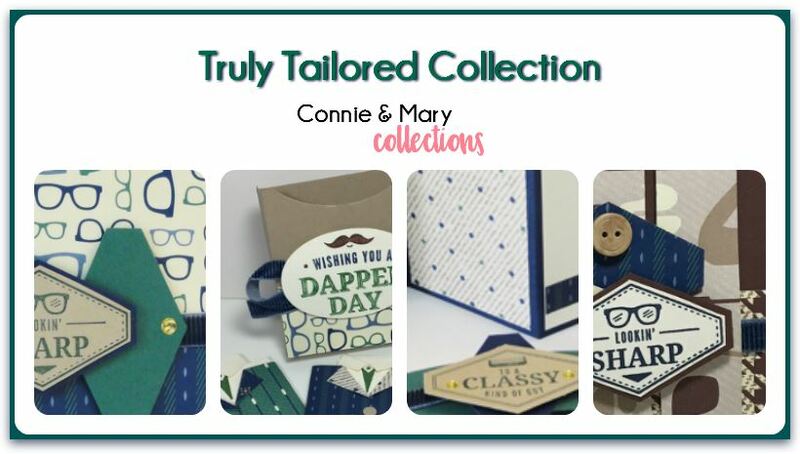 Designed by Connie and Mary, this Collection includes an exclusive 3D Origami Packet & Box project you can use for SO many occasions…and three cards (one with a special fold!) See more details HERE! 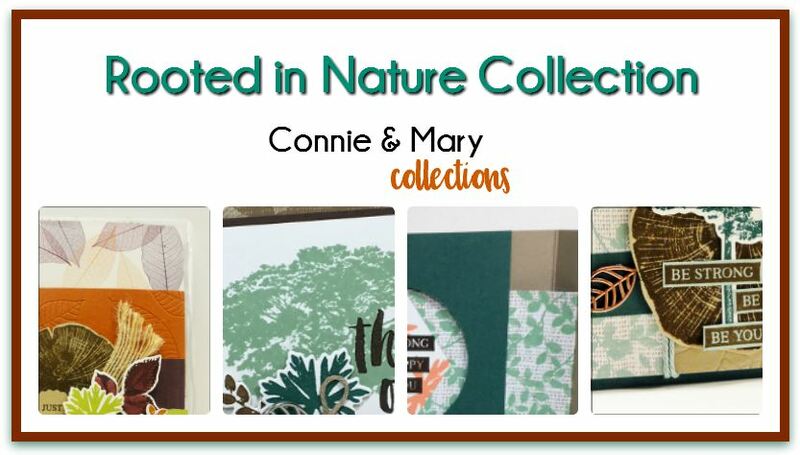 We have a tutorial collection using Stampin’ Up!’s Rooted in Nature Product Suite. 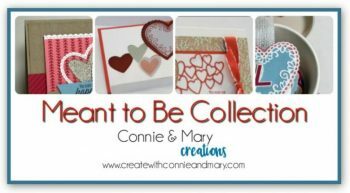 Designed by Connie and Mary, this Collection includes an exclusive 3D Sweet Treat project tutorial…perfect for gift giving…and three cards, including one with a special FUN fold! See more details HERE! Are you a demo and LOVE the new Abstract Impressions? You are going to want these tutorials for your New Catalog Open Houses or classes! One project is a note card set that features all five of the new IN COLORS to fit in awesome handmade box, the other is a card set of four that fits perfectly in a decorated Acetate box! 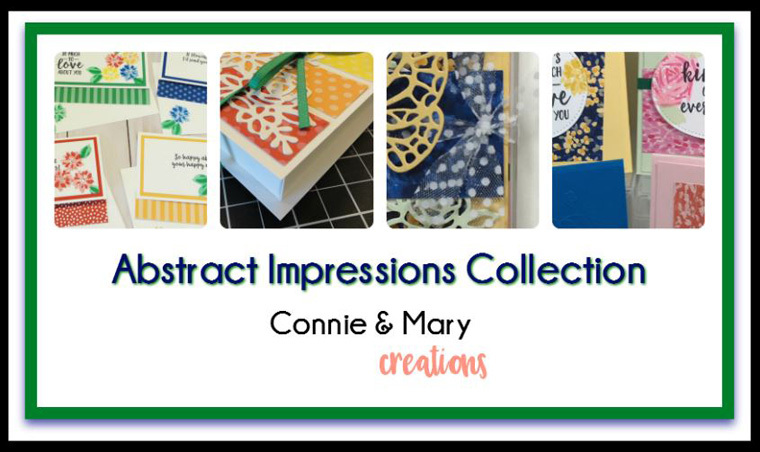 Designed by Connie and Mary, both projects use the Abstract Impressions Stamp Set and Thinlits! See the details HERE! Tutorial includes specific directions for three cards (one a unique fold card) and exclusively designed Color Inventory Tool to keep track of the new Color Revamp Collections. And, we are using the “Share What You Love” Product Suite. This is a PERFECT class to introduce to your customers to this gorgeous product suite and and new colors. SEE DETAILS HERE! Barn Door Home Decor Collection PDF is still available. Tutorial includes specific directions for FOUR Seasonal Barn Door frame inserts! Purchase one 8×8 frame and change out the inserts throughout the year! Find details HERE! Brusho Crystals Technique Collection PDF only! Tutorial includes specific directions for SIX techniques using the fun Brusho Crystals on your cards, plus directions to finish the cards using the Birthday Wit stamp set or use a greeting set of your own. Find the details HERE! 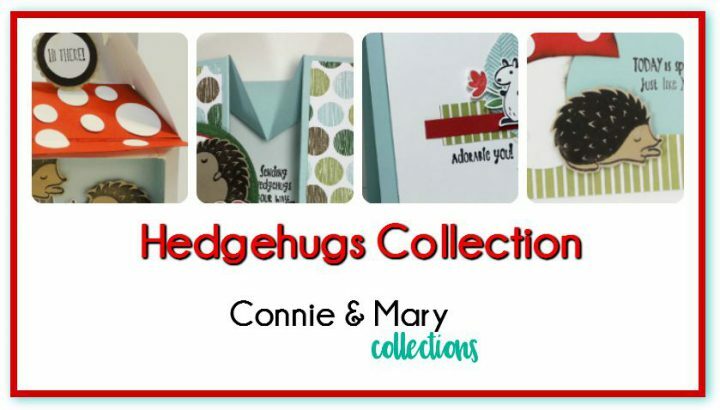 Hedgehugs PDF Tutorial only – order your own products and cut your own cardstock. Upon payment, you will immediately get the step-by-step tutorial pdf file, emailed to you thru Fastwagon, with all the step-by-step instructions you need to complete the four projects using your own products. The PDF Tutorial is available for anyone to order, but is in Imperial measurements. Truly Tailored PDF Tutorial only – order your own products and cut your own cardstock. Upon payment, you will immediately get the step-by-step tutorial pdf file, emailed to you thru Fastwagon, with all the step-by-step instructions you need to complete the four projects using your own products. The PDF Tutorial is available for anyone to order, but is in Imperial measurements. More details click HERE! A Good Day PDF Tutorial only – order your own products and cut your own cardstock. Upon payment, you will immediately get the step-by-step tutorial pdf file, emailed to you thru Fastwagon, with all the step-by-step instructions you need to complete the four projects using your own products. The PDF Tutorial is available for anyone to order, but is in Imperial measurements. More details click HERE! 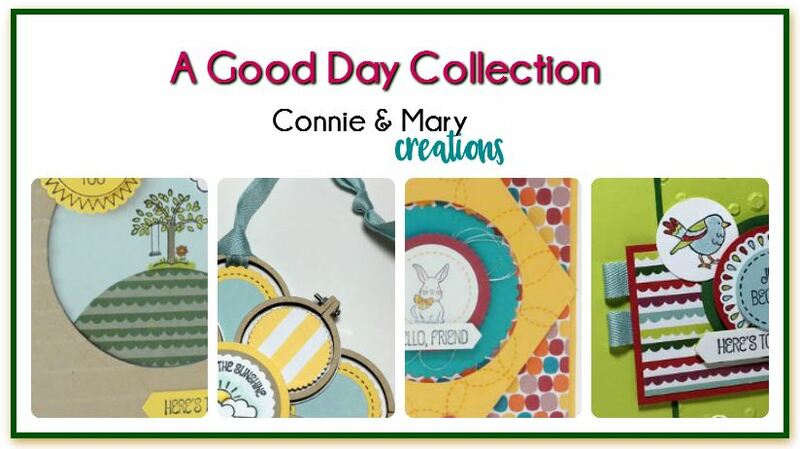 *Add the A Good Day stamp set for $28…email us at createwithconnieandmary@gmail.com for invoice. Product will be shipped direct from Stampin’ Up! to you. 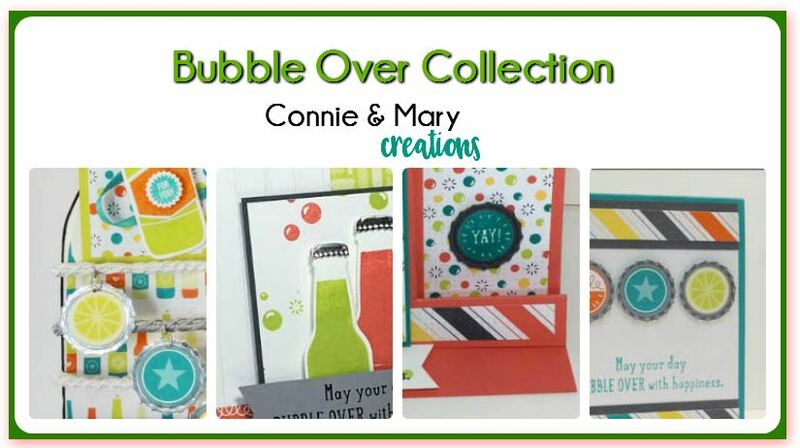 Bubble Over PDF Tutorial only – order your own products and cut your own cardstock. Upon payment, you will immediately get the step-by-step tutorial pdf file, emailed to you thru Fastwagon, with all the step-by-step instructions you need to complete the four projects using your own products. The PDF Tutorial is available for anyone to order, but is in Imperial measurements. *Add the Bubble Over Stamps and Framelits for $56. 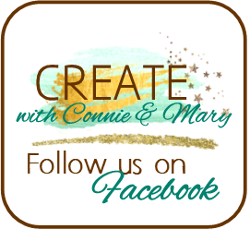 Email us at createwithconnieandmary@gmail.com for invoice. Product will be shipped direct from Stampin’ Up! to you. Picture Perfect Birthday PDF Tutorial only – order your own products and cut your own cardstock. Upon payment, you will immediately get the step-by-step tutorial pdf file, emailed to you thru Fastwagon, with all the step-by-step instructions you need to complete the four projects using your own products. The PDF Tutorial is available for anyone to order, but is in Imperial measurements. 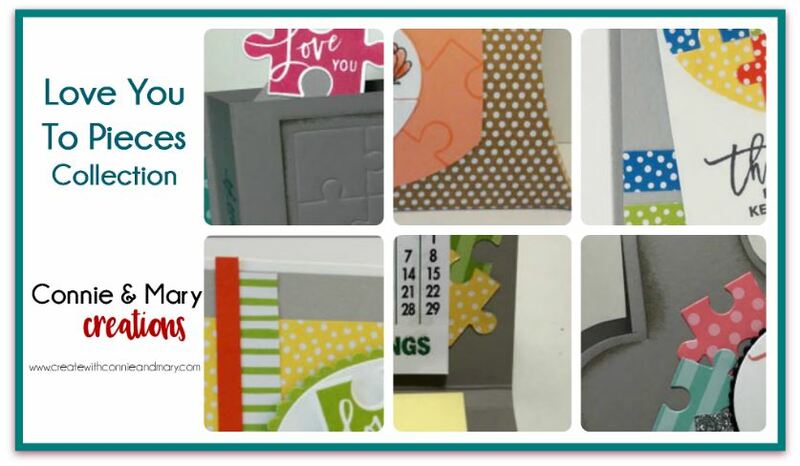 Sure Do Love You PDF Tutorial only – order your own products and cut your own cardstock. Upon payment, you will immediately get the step-by-step tutorial pdf file, emailed to you thru Fastwagon, with all the step-by-step instructions you need to complete the four projects using your own products. The PDF Tutorial is available for anyone to order, but is in Imperial measurements.